Prize: Enter daily for your chance to win! 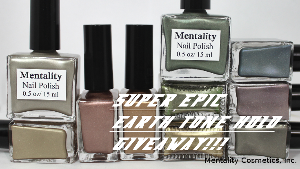 Mentality Nail Polish will awayd 4 lucky fans each a complete Earth Tone Holo Collection. This collection includes all 10 of the Earth Tone Holographic nail polilshes in our collection, a full rainbow! What you must do to enter: Enter daily and often from a wife variety of Rafflecopter options. Earn lots of chances everyday!